Days after the end of Rio’s Carnival, Brazil’s government has sent in the military to take command of public security in the state. It’s the first such intervention since the country’s dictatorship fell in the mid-1980s. Military interventions in Rio are not new and have frequently been criticised for failing to reduce crime and for leading to abuses. The military has been deployed to Rio several times in recent years, but the new measure will give it total control of public-security functions there. Rio’s governor will continue to run the state government. “Together, the police and the armed forces will combat and confront those who have kidnapped our cities,” Temer said at a signing ceremony. Gangs have “virtually taken over” Rio’s metropolitan area, home to 12 million people, he added. “Our prisons will no longer be offices for thieves, our public squares party halls for organised crime. I know it’s an extreme measure but many times Brazil requires extreme measures to put things in order,” he said. The decision came days after the end of Rio’s Carnival celebration and is the first such action since Brazil’s military dictatorship fell in the mid-1980s. The decree is expected to be approved by Congress next week, though opposition lawmakers have come out against it, calling it an effort to distract from Temer’s inability to govern. Temer met with legislators about the decree on Thursday,according to AFP, but Friday’s announcement reportedly came as a surprise to Brazil’s military command, which was unclear on the scope of the intervention and the role federal forces would play. “We must join forces to combat crime,” he said without offering details. Violence has become pervasive in Rio, intensifying after the city hosted the 2016 Summer Olympics. The 2,125 killings in 2017 were 37% more than in 2014. According to state-government statistics, 2017’s homicides were 26% more than the total in 2015 and 8% more than the number in 2016. Residents often find themselves caught in the crossfire during clashes between rival criminal groups as well as between police and criminals. One local newspaper has started covering violence in a section called “Rio War,” which was criticised for echoing the aggressive rhetoric used by the government and others to justify militarised anti-crime strategies. 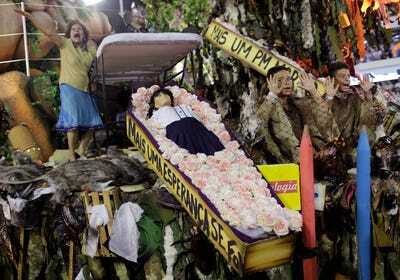 The city’s Carnival celebration, which ran from February 9 to February 13, was also marred by violence. Television networks showed footage of shootouts between gangs and teenagers attacking tourists in areas usually considered safe. The state governor admitted that his administration was not prepared to provide security during the festivities. He also said authorities confiscated an “incredible” number of firearms. (AP Photo/Silvia Izquierdo)Members from the Beija Flor samba school perform on a float with a coffin containing a doll representing a dead student during Carnival celebrations at the Sambadrome in Rio de Janeiro, February 13, 2018. While the state government initially said crime went down during this year’s festivities, data obtained by Rio newspaper O Dia indicated that homicides declined while robberies and car thefts increased. The state is grappling with crime as it faces a dire financial situation. Budget shortfalls have left the state police struggling to find supplies, and mass layoffs from national oil company Petrobras, the state’s largest corporate employer, have exacerbated economic hardships for residents. Rio state, home to 17 million people, has lost more than a half-million jobs over the past three years. 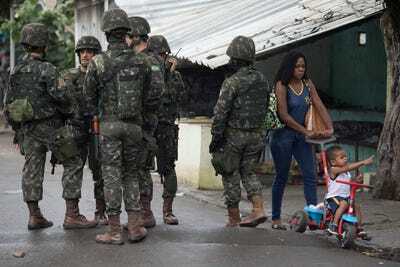 (AP Photo/Leo Correa)Locals walk past soldiers during a surprise operation in the City of God slum of Rio de Janeiro, February 7, 2018. Despite rampant violence in Rio, the state’s homicide rate remains well below peaks in the 1990s and is lower than the homicide rate in other states. Nineteen Brazilian cities were on a list of the 50 most violent cities in the world in 2016, but Rio was not among them. The disparity has led some to see Temer’s actions as politically motivated. Temer, who has approval ratings in the single digits, has been pushing for a vote on an unpopular pension-reform measure by the end of February, when legislators start to focus on reelection bids ahead of voting in October. Militarised responses to crime have been widely criticised for being ineffective and for leading to rights abuses. And many, including the head of the country’s military command, have said the military can do little to address an insecurity problem like that in Rio.